In a national survey asking consumers about their most bothering issues when it comes to carpet cleaning, the overwhelming #1 complaint was that the carpets were left too wet and took way too long to dry. The #2 complaint was that stains came back after the carpet had finally dried. Our process eliminates these consumer complaints. 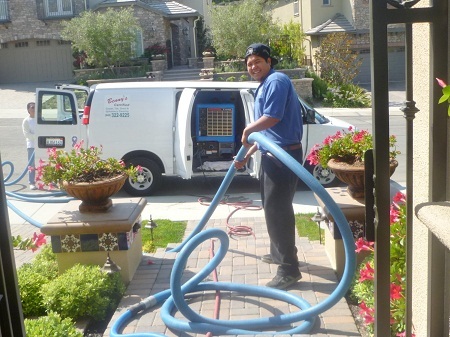 Most carpet cleaning companies still utilize a traditional steam cleaning (or hot water extraction) process. You’ve seen them with the big van out front with hoses running across the yard and into the house. Steam Cleaning (actually it’s really not steam – it’s just hot water) is a 40 year-old process that can leave the carpets wet for many hours (or even days). It is an old system that relies on high water pressure, detergent and hot water to clean – a system that can force water and dirt down into the pad and even the subfloor. The water and soap is then vacummed out of the carpet (only 60-80% actually comes out), but because the pad and subfloors are so wet, it takes a long time for the carpet to completely dry. This can cause wicking issues (stains coming back through evaporation), mildew and mold problems and quick re-soiling – not to mention a total inconvenience. 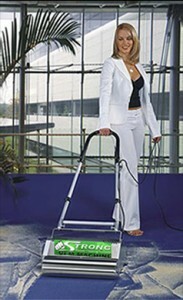 Like most other industries, the carpet cleaning industry has come a long way in 40 years. With modern low moisture carpet cleaning systems, carpets can be totally dry in 30 minutes or less; stains will not come back, and carpets will repel dirt after cleaning, keeping them clean much longer. Besides the dry time advantage our dry organic carpet cleaning system has over carpet steam cleaning, our 6 step process provides an incredibly deep cleaning. We start with a thorough vacuuming and then treat all spots and stains. We follow the pre-treatment by applying a mist of zero residue accelerator which breaks down any lingering soil, grease or dirt. Then we apply our dry cleaning compound and brush it through the carpet from the bottom up with our special dry carpet cleaning machine. This process absorbs and removes any remaining oil- or water-based soil and particulates from the carpet. A final grooming finishes the process leaving your carpet clean, fresh, restored and dry within minutes.